Nagaland, the far north-eastern part of India. Coming to their cuisine, it is not for the faint-heart. yes, people of Nagaland, respect everything as food. They eat worms, insects, pigs, fowl, and very famous for dog meat. Oh yes, they don't feel bad about it, it is part of their culture, so they eat. A Naga kitchen is never put off, meaning the kitchen fire is never put off, something or the other keeps cooking, or atleast fresh meat will be hung high above the stove for drying. (source Flavors of india youtube video). While wandering on the Net, for a veg recipe from this tribal cuisine, which is almost next to impossible, i came across this travel blog The Wanderers Blog, where the writer has traveled around the Seven sister states and spent a whopping 3 days in Nagaland alone, meeting the Naga chiefs, tasting their cuisine and culture. It gave a good insight into their culture. If you are intersted to read about their travel, here is the link. Coming to today's recipe, i found this kali dal/Black lentils cooked with chicken here, so i made it without the chicken and Tomato Chutney,i found it here. Naga Chili chutney is so famous, called the Raja Mirchi/Bhut Jholakia – the worlds spiciest chilli . Bhut Jholakia grown in Upper Assam and Nagaland is much spicier than that found in Guwahati. The easiest way that these chillies are consumed are by drying them in the sun for an hour or so, then they are sliced and immersed in mustard oil. The jar is kept in the sun for a week and the pickle is then enjoyed year long. 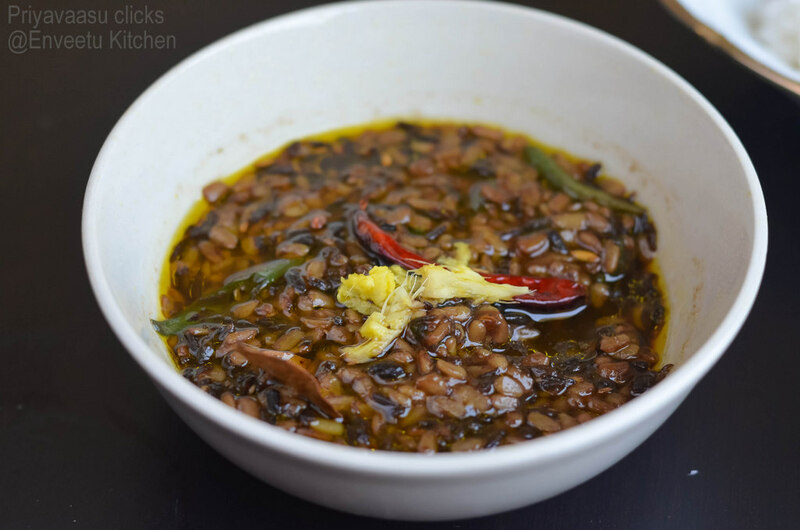 It is said that, it tastes fieriest as such, but when paired with rice or any of their bland meat dishes,you won't require a fire engine to douse the heat!!! Soak the dal for 30 minutes,drain and keep aside. Take a pan, add twice the amount of water, bring it to a boil. Add the soaked dal, green chilies and a pinch of baking soda to this. Cover and cook until the dal is cooked completely, but not mushy. For this amount, it took almost 30 minutes, in a low flame. Remove the cover and cook until the liquid is almost absorbed. Transfer it to another bowl. Heat a tadka/tempering pan, add mustard oil, bay leaf, red chili and panch phoran.When the seeds crackle, pour the tempering on the dal and garnish with shredded ginger. Serve it along steaming hot rice. Take all the ingredients in a pan, add 1 cup of water to this and cook until, the tomatoes are mushy and the dish holds no shape. Mash it well with a potato masher or back of a laddle. Transfer it to a bowl and serve with Rice and Dal. Nice combo Priya. Kali dal is so flavorful I am sure it tasted great. I loved the post. .really enjoyed reading it.the black daal looks so yum with those beautiful clicks..the chilli chutney. .wow..my mouth is watering. Nice combination. Dal looks yummy. Both looks wonderful, i should buy black urad dal soon to give a try this nutritious dal, thats a fingerlicking chutney. so hearty and delicious!!! very tasty!! They look good, Priya. I had a tough time looking for recipes from this state! Your plate looks so yum Priya..very good choice.. Interesting preparation with kali dal. 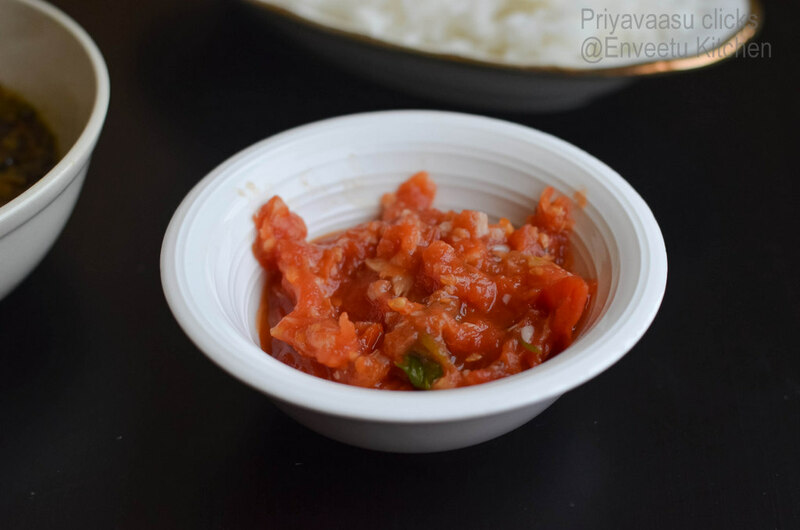 Tomato chutney looks vibrant and delicious. 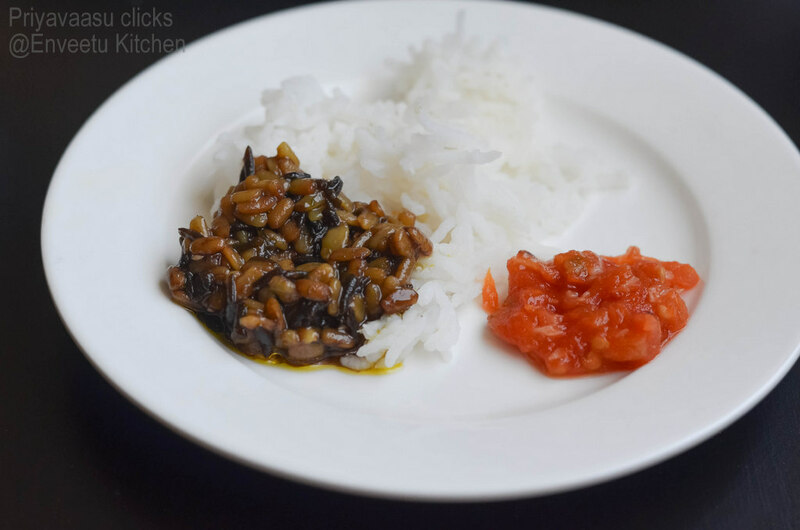 Klai dal looks good and love the color of that tomato chutney. Nice recipes for the state. Nice pick,both the dishes look delicious and yummy..
Wow Priya teh pics are making me drool. I am bookmarking this one.